Whether you’re 5 or 85 years old the Dolphin Academy Curaçao makes your childhood dreams come true. Dozens of dolphins swim in the natural lagoon of the Dolphin Academy Curaçao. Meet and greet the happy fellows, go swimming or free diving with the dolphins and discover how smart and friendly these creatures are. 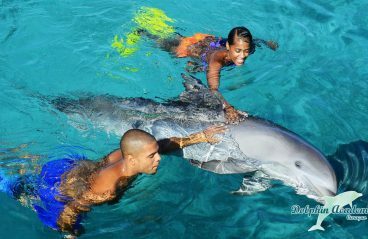 Taking good care of the dolphins is the number one priority of the Dolphin Academy Curaçao. The physical and mental well-being of the animals is of utmost importance. Therefore a strict amount of participants is permitted during each encounter. This always makes the interaction intimate and genuine to both the dolphins and the people. Even though the natural lagoon of the Dolphin Academy Curaçao is nice and spacious, allowing the dolphins to swim away from activities whenever they like, the trainers take the dolphins on daily excursions to the open ocean. In this way, the dolphins are free to choose between the ocean and their “home” at the Dolphin Academy Curaçao. The Dolphin Academy is located inside the Sea Aquarium, where a fun day awaits the whole family. 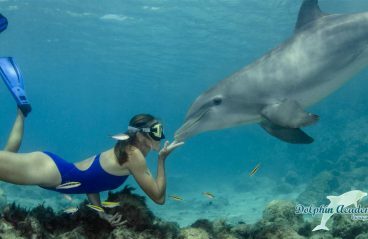 You’ll learn everything about sea life around Curaçao, help feed the nurse sharks and, of course, meet the dolphins. During a Dolphin Encounter, you stand in waist-deep water and you can pet, hug and kiss the dolphins. Would you like to come up very close to the dolphins? 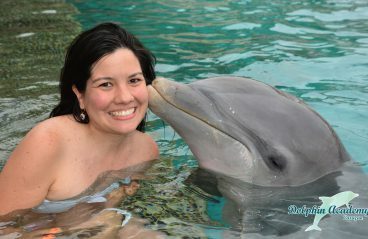 At the Dolphin Academy Curaçao you can Swim with Dolphins. The creatures will sing, wave and spin next to you in the water. They even take you for a ride! Are you an experienced swimmer who loves to free dive? Then book an unforgettable Free Dive with Dolphins at the Dolphin Academy Curaçao!